Just a little update on what is happening in my work life. I have become a member of a cooperative art gallery here in Melbourne in the Eau Gallie (pronounced oh-galley) Art District. The gallery is called, Art and Antiques. I will be going over this afternoon with my first paintings to be hung in the gallery, and I'll have a small assortment of limited edition prints, greeting cards and miniature fine art pins. The Eau Gallie Art District, where several, very nice, small galleries exist, hold a gallery walk on the first Friday of every month. Each gallery has an opening with new art, music, wine and hors d'oeuvres. Sometimes there are live musicians playing in the street, and it is a very nice time! After the walk many folks enjoy eating dinner at one of the fine restaurants in the area. If you are ever in Melbourne, Florida on the First Friday, come and see the beautiful artwork, enjoy a stroll in old Eau Gallie and say hello! I have a few street fairs coming up in April. 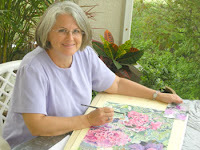 To stay tuned with where I will be please visit my website: http://watercolorworksart.com.